It is replaced by the Intermec CK61: CK61B. Intermec's CK61: CK61A mobile computer provides everything demanded by the tough route environment, Battery capacity to work all day long, rugged design to provide years of reliable service, next generation processor and operating system to run complex application software and non-volatile Persistent Storage to protect data. 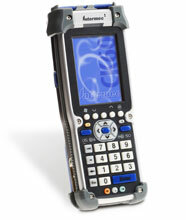 The CK61: CK61A provides multiple ways in which data may be exchanged between the handheld computer and other devices. Most models have high-speed Ethernet, USB Host and Client, and RS-232 serial connections and a Wi-Fi-certified 802.11b/g radio for local area wireless communications.